There are many different ways to approach shopping for school supplies. Some families order their bounty from the PTO. It’s a way to cross yet another fundraiser off the list. Others wait until after the first day of school just to make sure the teacher hasn’t made any changes or additions to their must have’s. 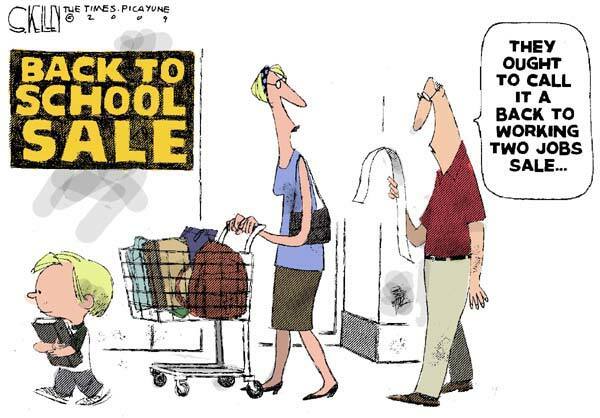 But, I think most parents, in eager anticipation of the start of school, hit the shopping aisles at least a week before the big day. As I seasoned mother I’m used to crowds associated with back to school shopping. But surprisingly I have never, ever, ventured out during a tax-free weekend. Last Saturday, I was at Target pushing my cart to the office supply aisle to buy some computer paper when I was overwhelmed by a horde of school supply shoppers. I had to abandon cart and by that I mean leave it in the men’s underwear section, grab my purse, fresh from the snack bar Diet Coke and shimmy down two aisles just to get close to the computer paper. Now a somewhat sane person or an individual with superior time management skills would have taken one look at the hustle and bustle, promptly turned around and ventured off to less crowded environs. But none of the above describes me at all. Sure, I thought about leaving but then I heard a mom threaten her two daughters with “ugly notebooks” if they didn’t behave. A parent using school supplies as a punishment, well you just know I had to stay and see how this played out. I took a sip of my Diet Coke and settled in by the bin of wide ruled paper. Disappointingly, the mother demonstrated very 21st century parenting techniques and did not follow through on her ultimatum at all. Her girls continued to throw pencil cases at one another and they still got pretty spiral notebooks with flowers on them. As I was standing there contemplating the general lack of follow through in parenting (myself included) a grandma asked me if I knew where and what a dry erase marker was. Indeed I did and it was my pleasure to explain to her the wonders of the white board. I found out she was there buying school supplies for her three grandchildren while the family was on vacation. I told her she deserved a medal. The grandma laughed and confessed that if she had known how long the school supply lists were she might have changed her mind about helping out. This got us talking about back in the day and the grandma said when she was a kid she went to school with a notebook and a pencil. That got me thinking and I’m pretty sure all I brought to school was lunch. Hmm, when did school supply lists start exceeding one page? Another question for you, what do kids do with all those Post It Notes and 3 X 5 index cards we have to buy? I’m certain in my parenting career I’ve bought enough Post It Notes and index cards to circle the earth. And what’s up with the graphing calculator that exceeds $100? Ouch, on that one. I might have continued my visit with the grandma but two women were getting agitated over who was going to get the last pink composition notebook. My attention, as you can imagine, was immediately diverted. My money was on the bigger mom being the victor in the notebook grab and go. And this is why I don’t gamble; the smaller mother had some mighty long fingernails, and like a hawk grabbing a Yorki Poo from a backyard that’s country club golf course adjacent, the mini mom extended her talons, clutched the notebook and took off. I figured that was my excitement for the day (and really it was kind of exciting) so I got my computer paper, found my cart and continued shopping on the other side of the store. While I was pursuing cleaning supplies two youngish moms were having an in-depth conversation about the boxes of Kleenex that were stacked on two shelves below the bleach. Both moms had Kleenex on their kid’s school supply list and their dilemma was whether to go generic Kleenex and get the basic blow your nose variety in the non decorator box or really show you care and buy expensive tissue. I decided I should help them out and told them you can never go wrong with spending a little more on your school Kleenex purchase. Consider it preliminary sucking it. Oh, and this is most important put our kid’s name in Sharpie on the Kleenex box. That way the teacher knows you spent the big bucks and went Ultra Soft with Lotion. In fact, put your kid’s name on everything most especially the graphing calculator that cost more than my first car payment. You thought things were interesting at Target. Girl, you missed the boat by not going to Walmart. One mom started throwing packages of paper because Walmart didn’t have her kids school supply lists posted. Unlike you I didn’t stay to watch. I ran outta there. Yes, that graphing calculator still gets me too. Not enough I had to do it once for my husband when he was in college. Oh, no, then I had to get the more up-to-date version for my son when he hit middle school because the older version was not on the list of acceptable ones to have. Then of course, he moved across the country and took his with him so my youngest needed new one when he hit middle school and that one was even more up-to-date. Right. God help us all for giving into this madness. Am thinking unless you’re a scientist or a mathematician these should not be required. The stores have better sales because they have to get rid of the over-order they did for the crazy, worse than Black Friday, complete child-parent melt down weekend. If you think school supplies were bad, try a clothing store. Worse than Black Friday because parents bring ALL of their children in to try on ALL of the possible outfits they could need, leave half of it in the dressing rooms, the other half on the floor and then realize they need new shoes…..all usually during the part of the day when everyone’s blood sugar is dropping…..